New from Modality, Inc. and Pearson Education, each app in the AlgebraPrep series from focuses on a key algebra topic and features a Practice Test and MiniTests to help students build skills and gain confidence. The revolutionary capabilities of iPhone and iPod touch enable students to access a variety of learning content just by tapping the device screen, and immediate feedback is provided to the user in the form of quick tips and step-by-step video solutions from award-winning instructor and bestselling author Elayn Martin-Gay. 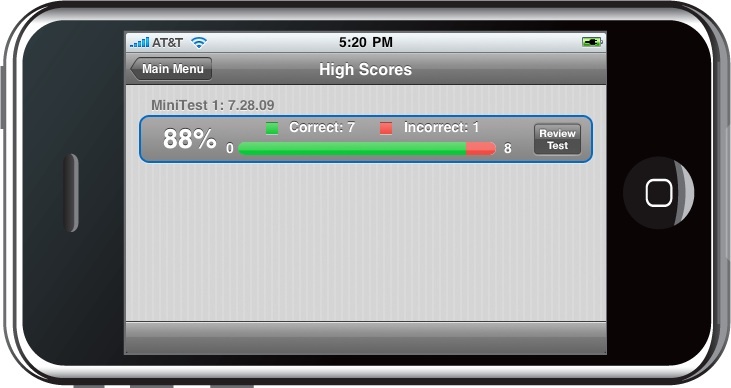 The new AlgebraPrep series for iPhone and iPod touch helps students build skills and confidence. Pearson Education and Modality, Inc. today announced the AlgebraPrep: Factoring application is available on the App Store. This iPhone™ and iPod touch® app, comprised of practice tests and video tutorials by the award-winning instructor and bestselling author Elayn Martin-Gay, is designed to provide supplemental help for students in or out of class. Each app in the AlgebraPrep series focuses on a key algebra topic and features a “Practice Test” to help students build skills and gain confidence. The revolutionary capabilities of iPhone and iPod touch enable students to access a variety of learning content just by tapping the device screen. Questions in the “Practice Test” provide immediate feedback to the user in the form of quick tips and step-by-step video solutions from Elayn Martin-Gay. After completing the “Practice Test,” students move onto the “Mini-Tests,” to apply what they’ve learned in a more challenging framework. Each Mini-Test is designed to take 10 minutes or less to complete, in order to encourage valuable math review even in small windows of time. Pearson (NYSE:PSO), the global leader in education and education technology, reaches and engages today's digital natives with effective and personalized learning, as well as dedicated professional development for their teachers. This commitment is demonstrated in the company's investment in innovative print and digital education materials for preK through college, student information systems and learning management systems, teacher professional development, career certification programs, and testing and assessment products that set the standard for the industry. The company's respected brands include Scott Foresman, Prentice Hall, Addison Wesley, Benjamin Cummings, PEMSolutions, Stanford 10, SuccessNet, MyLabs, PowerSchool, SuccessMaker and many others. Pearson's comprehensive offerings help inform targeted instruction and intervention so that success is within reach of every student at every level of education. Pearson's commitment to education for all is supported by the global philanthropic initiatives of the Pearson Foundation. Pearson's other primary businesses include the Financial Times Group and the Penguin Group. For more information, go to http://www.pearson.com. Modality, Inc. believes every moment can be a learning moment. By taking the most trusted, relevant educational content on the market and reinventing it for the small screen, Modality creates mobile learning applications that fully engage users with the material they need to know. Anywhere, anytime, right on their favorite devices. Modality’s content partners include Aspen Publishers, Elsevier, Lippincott Williams & Wilkins, McGraw-Hill, Pearson, The Princeton Review, John Wiley & Sons, and Workman Publishing Co. Visit http://www.Modality.com for more information. An award-winning instructor and best-selling author, Elayn Martin-Gay has taught mathematics at the University of New Orleans for more than 25 years. Her numerous teaching awards include the local University Alumni Association’s Award for Excellence in Teaching, and Outstanding Developmental Educator at University of New Orleans, presented by the Louisiana Association of Developmental Educators. Prior to writing textbooks, Elayn developed an acclaimed series of lecture videos to support developmental mathematics students in their quest for success. These highly successful videos served as the foundation material for her texts. Her textbooks and acclaimed video program support Elayn's passion of helping every student to succeed.